Flippers are obstacles in the game Balloon Fight that appear as items in Super Smash Bros. Melee, replacing Bumpers. Players can pick it up and throw it; when thrown, it will hover in the air. Any player who comes in contact with it gets hurt, and the flipper spins around, hurting other people. After some amount of time, it disappears. Flippers move along with the stage if it is a moving stage. This can be used by players in stages such as Big Blue to place the flipper which then hits another character who is standing on the flipper's route. In Bonus mode, there are special points awarded if an opponent is KO'd using a flipper. 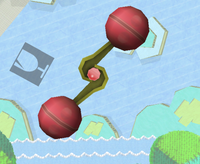 Retaining its original appearance, Flippers appear as a stage hazard on the Balloon Fight stage in Super Smash Bros. for Nintendo 3DS and Super Smash Bros. Ultimate. 6/86 Made famous as an unpredictable obstacle in Balloon Fight, the Flipper stops and hangs in midair when thrown. Any character who comes in contact with the bumper-balls on its ends will be knocked away as the Flipper spins wildly. Flippers can be a bit irksome: in Balloon Fight they caused accidents to friends and foes alike. This page was last edited on December 19, 2018, at 14:48.